Istanbul, Turkey: IHA IP live video streaming service. 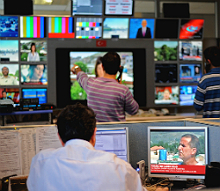 Istanbul, Turkey, February 2015: The international broadcast services company, IHA, has launched a new IP streaming service for its clients wishing to transmit live from various locations in Europe, Turkey and the United States. The company - with its headquarters in Istanbul - has invested in 14 Magic Box camera units which enable users to generate a high-quality live signal over the internet. The IP units have been installed in multiple locations in Turkey as well as in other major global centres such as Washington DC, Paris and London. IHA, which offers newsgathering and production services at major events around the world, says the new facilities will enable clients "to go on air from any location any time".